The World Service Group is open to all concerned individuals who want to do their part in service to help the Beings who guide Humanity. Participants strive to create positive thought-forms through the use of creative visualizations, affirmations, meditations and send positive energy forth each month. The meetings begin promptly at 8:00 pm; refreshments are served following each meeting. In CHEMAM we believe that Astrology is an excellent tool for gaining an understanding of how the forces of the personality work. As you apply the different principles of the signs and planets to your life the potential for a depth of self-awareness is tremendous. Join us to discover for yourself the benefit that the study of Astrology may have for your inner development! Basic Astrology I begins Sat, Jan 12, 2019. This series builds upon the foundation established in Basic Astrology I. Each class covers topics that explore the relationships between the signs and the planets. Students are given ample opportunity to learn more about themselves by applying the class lessons to their own chart. This series will introduce the ephemeris as a tool to identify current planetary transits to the student's charts. Prerequisite: Basic Astrology I. The study of transits and their effect will open you up to the understanding of the patterns and dynamics of transiting planets as they move, thus indicating how they ` might affect your day to day life. Secondary Progressions is the most popular system of progressions. Learn another tool used to bring the natal chart into the present moment. During this four week class you will have the opportunity to learn how to calculate and read secondary progressions as they relate to your natal chart. Personalities are formed through a symphony of cycles which move one through life. Educators, psychologists, counselors, social workers and astrologers, to name a few, recognize cycles and understand their importance in human development. Although their names may vary, these cycles are all recognized as distinct periods of change and potential growth. Astrologers study the relationship of the planets and their cycles. Individuals become conscious of these astrological dynamics through practical application which is vital to one’s personal and spiritual growth. Join us for an opportunity to learn the cycles of Saturn and recognize the effects it may have on your life. Astrologers study the relationship of the planets and their cycles. Individuals become conscious of these astrological dynamics through practical application which is vital to one's personal and spiritual growth. Join us for an opportunity to learn the cycles of Jupiter while exploring its expansive dynamic throughout your lifetime. Astrology is a continuous learning process related to the science of cycles that affects us individually and as a humanity. Each year, each individual experiences a solar return which is the dynamic of one's natal sun returning to its exact position as it was at birth. In addition, within one's solar cycle there are 13 lunar cycles. This SOLAR & LUNAR RETURNS CLASS provides students with both the knowledge as well as a practical application of charting and exploring these particular energies. Using a tri-wheel printout of one's natal, solar and lunar charts, students will learn to identify patterns of thoughts, emotions and behaviors as they relate to their solar and lunar cycles. When one's solar and lunar returns are consistently charted and followed, there is a profound opportunity for deeper Self Awareness. CHEMAM offers Astrology Reading by request. Call 216-261-2502 to schedule a reading. Get your chart read complete with a copy of your Natal Chart and current Solar Return as well as an Astrological Report. You can order your charts and/or reports by sending in a check and order form. Click here for a order form and instructions. Cost: See order form as prices vary by chart/ report. CHEMAM offers Astrology Coaching by request. Call 216-261-2502 for further information and to schedule an Astrology Coaching Appointment. The Self-Realization Program offers an exceptional opportunity to foster one's spiritual development. There are five components which together form a comprehensive program. They include classes, the learning and application of transformative techniques, and coaching - taught with a very practical experiential approach. Students can engage in one, some or all of the components as they create their individual programs. This series of classes are for those interested in learning the higher potential of human life. They include discovering more of who you are and what your purpose is from a spiritual perspective as written by many of the mystics of the past. Understanding these metaphysical principles is the first step in gaining more authority over your life. Begin applying these to work toward becoming more of a co-creator with the greater plan. Classes may be taken individually or as a whole series. They are also prerequisites for our clearance program. We strive to make our classes not only intentful but lively, fun and growthful. Chakra is the Sanskrit word for wheel or disc. It is an energy centre within the etheric body, formed by the intersection of many strands of etheric light. This class will cover the crown, ajna, throat, heart, solar plexus, sacral coccyx centers -- from a practical and experiential perspective. Glamour refers to emotional being and desire, forces which distort the truth and create a faulty reflection of reality. This class will explore the world of Glamour, and how to re-qualify it to begin to experience life and reality from a truer perspective. This class synthesizes the information of the previous six classes. It will lay a foundation for all subsequent studies in the Clearance Program, for those who choose to proceed. This class relies on teachings from A Study in Consciousness by Annie Besant. This class will help you to wrap your mind around what it means to be "a spiritual being having a human experience". Through readings, interactive presentations and experiential exercises, together we will create an atmosphere to foster expanded awareness, deeper understanding and spiritual growth. With greater comprehension of our "whole selves", we each have more power to create positive realities and find out how we fit into the greater plaln. Join us as we learn aboout our "Seven Bodies" -- bond together, share together and grow together. Within the Etheric Body, there are seven light centers or Chakras. The central “hub” of each major light or energy center in the Etheric Body relates to a major gland in the physical body. This class will cover the glands of the endocrine system and their connection to the Chakras. Just as there are seven bodies and seven centers, there are seven planes. They correspond to the seven states of consciousness in man and are made of conditioned matter. This class will explore the Etheric, Astral, Mental, Buddhic, Spiritual, Monadic and Divine Planes. This class will explore the rays which are in essence the energies that we call "consciousness". Each individual human soul expresses predominantly one of the seven rays. Through a succession of lifetimes, the qualities of the rays are developed and refined to further the evolution of human consciousness. Clearance is a technique that supports spiritual growth and healing. If applied and internalized, it can set in motion a transmutative progression to eventually realize the energies of one's higher self. It is a method that combines visualization, prayer and intention and can be utilized by an individual or by a team of two. The primary focus is on self-transmutation and inner discovery. It can be used as a complimentary tool for healing, harmony, balance and alignment. For those wishing to become Clearance Technologists -- receptivity, sincerity and intention are essential qualities. These, along with the degree of effort and application, will determine the time needed to develop the skill and art of effective clearance. The journey begins with the Spiritual Class Series. These classes are the prerequisites for the Clearance Program. After completion of the seven classes of the Spiritual Class Series, additional levels of classes are available. Basic Clearance Class teaches the basic principles and techniques related to clearance and personal transformation. Clearance Training [to become a Clearance Technologist] is a 12-month commitment including 2 months of weekly classes, 7 months of Workshops [twice a month] and 3 months of Clearance Service. Contact Bridgit for more information or to schedule coaching. Some of the most profound experiences come when you make a conscious decision and take an action to achieve an internal quality change. This series of workshops is designed for those individuals who are highly motivated to make such a soulful change. Within a focused supportive environment you will be guided to explore the hidden potential of your soul's expression through a written plan and service. NURTURE YOURSELF AT THE "I MATTER"
In this very busy and stressful world, one needs to find a sanctuary: a place to help bridge the gap between the outer and inner worlds we occupy. CHEMAM is providing such a place. This is a time of transition from the intensity that drives one's work week to the centeredness of a soulful place within. One can choose from a menu of services to help with this transition each week. Improve your health, strengthen your spiritual connection or just have fun. Contact Bridgit for more information or to make an appointment. Email [email protected]ail.com or Phone 216.261.2502. The practitioners of The "I MATTER" Salon are listed below. Included are the practitioners who provide individual sessions as well class & workshop teachers / facilitators. Bridgit has spent the past 25 years training in CHEMAM using the transformation process to develop her inner self and is now excited to share her experiences and knowledge with those interested. She is a CHEMAM Certified Astrologist and a Clearance Technologist. 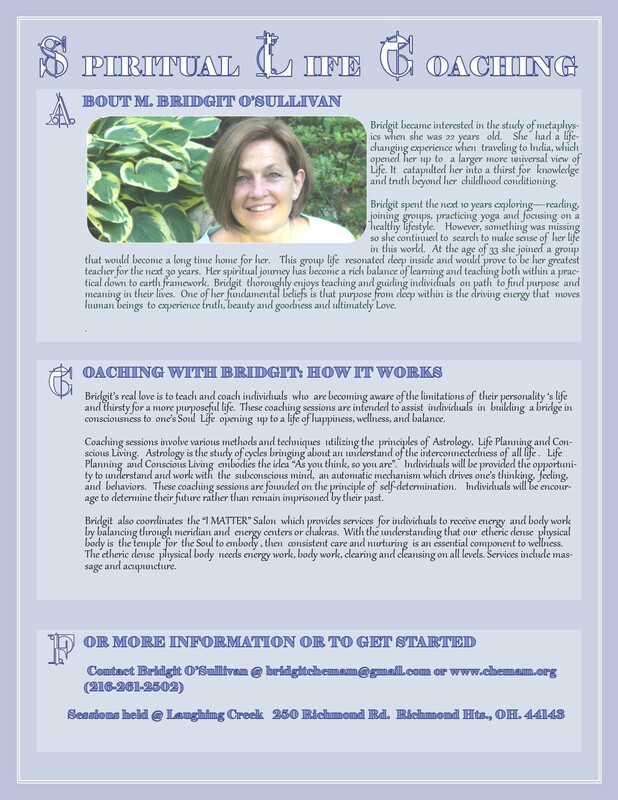 Bridgit teaches, coaches and provides readings. She is the founder and coordinator of the “I Matter” Salon. Brooke is an Ethical Massage Practitioner who specializes in relaxation / stress reduction (Swedish) Massage and Chair Massage. She is a certified member of the Associated Bodywork & Massage Professionals (ABMP). Jennifer is an Ethical Massage Practitioner specializing in stress reducing and relaxation massage techniques. She believes in treating the body as a whole, as each muscle is intertwined and connected to each other. Your body reaps more of the wonderful benefits of a whole body massage. Some of these healthy benefits are overall stress reduction, more restful sleep, improved circulation, relaxation of muscle tissue, enhanced sense of well-being and can also aid in pain relief. She currently works on several athletes including gymnasts, runners, ballroom dancers and people who are just looking for relaxation! Conscious Living requires opening your heart and observing what IS. Conscious Living requires being present and accepting of all aspects of one's Beingness. Over time we have been conditioned to view ourselves in a polarity: good-bad, right-wrong, smart-stupid, etc. Ignoring any one of those opposites can be destructive to our health. Compassion is seeing the WHOLE. It requires a heartfelt acceptance of "what is", without the surrounding emotional and mental qualifications.